The techniques covered can be applied to numerous fields, including security, telecommunications, healthcare, smart grids, and home automation. An online companion site enables readers to experiment with the techniques described in the book, and to adapt or enhance the techniques for their own use. 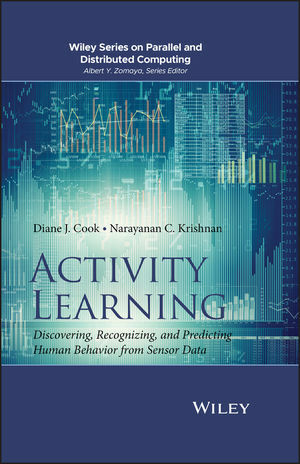 With an emphasis on computational approaches, Activity Learning: Discovering, Recognizing, and Predicting Human Behavior from Sensor Data provides graduate students and researchers with an algorithmic perspective to activity learning. Diane Cook, PhD, is a professor in the School of Electrical Engineering and Computer Science at Washington State University. Her research relating to artificial intelligence and data mining have been supported by grants from the National Science Foundation, the National Institutes of Health, NASA, DARPA, USAF, NRL, and DHS. She is the co-author of Mining Graph Data and Smart Environments, both published by Wiley. Dr. Cook is an IEEE Fellow and a member of AAAI. Narayanan C. Krishnan, PhD, is a faculty member of the Department of Computer Science and Engineering at the Indian Institute of Technology Ropar. His research focuses on activity recognition, pervasive computing, and applied machine learning. Dr. Krishnan received the gold medal for academic excellence in Masters of Technology in Computer Science in 2004 and was nominated for the Best PhD Thesis Award at Arizona State University in 2010.